It is always good to see a little banter and passion during a game of high intensity football, but with Gerard Pique and anything Real Madrid involved, it always seems to go a bit above healthy levels. Barcelona’s latest clash with Villarreal saw Pique apparently shout out at Madrid supporting president, Javier Tebas, in the stands after his side were denied a penalty. Pique’s frustration was evidently vented out at Tebas during their 1-1 draw against Villarreal after the referee failed to give a penalty in favour of FC Barcelona. The away side were closing in on a goal scoring opportunity with Lionel Messi’s shot until it hit the arm of Bruno Soriano, who was lying on the ground, and was deflected over the crossbar. 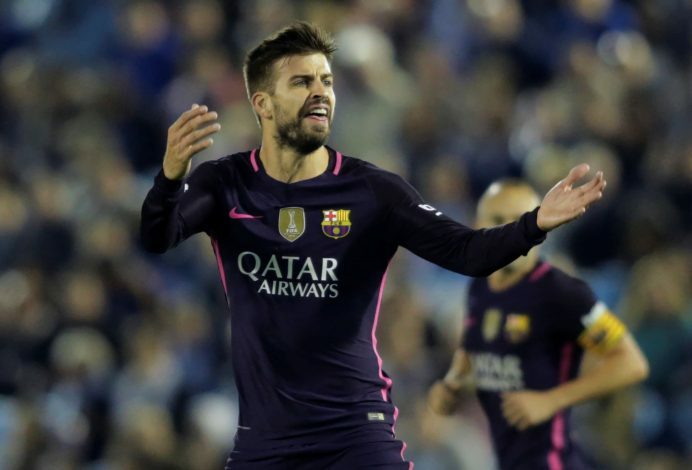 Pique, not known best for keeping shut and calm, appeared to yell ‘Did you see that? Yes, you, you!’ while looking towards the directors’ box where Tebas was seated watching the game. La Liga president Tebas was present at the game as a guest of honour, because the home team were inaugurating a new name for their Estadio de la Ceramica, known previously as El Madrigal. Referee Ignacio Iglesias was under scrutiny after the game for failing to give a clear cut decision to Barcelona, which was later described by their vice president Jodi Mestre as a deliberate hand ball. However, amidst all the confusion and anger, Lionel Messi managed to salvage a 90th minute draw for Barca with a gem of a free-kick, earning them a point and keeping them 5 points behind leaders Real Madrid. Barca supporters have lately expressed their unhappiness towards refereeing decisions going in the favour of Real Madrid which was further triggered by them getting a penalty last week in the Copa Del Rey despite Modric being pushed by his own player. Pique was adamant on his thought of having two clear penalties which were not awarded to them, and he showed no signs of punishment facing fear as he believed he was right and will be proved to be so yet again.